"We've included some stunning locations from around the world, and Apple TV will automatically play just the day or night shots, depneding on your time of day." "Let's dive in by pressing the home button. 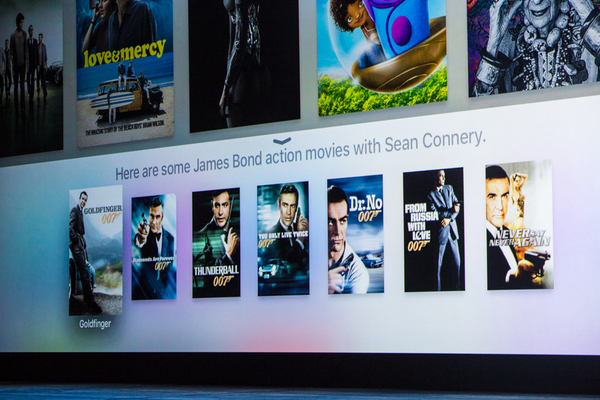 Home screen have access to movies and TVs on iTunes. App Store. Photos. And we've added Apple Music." 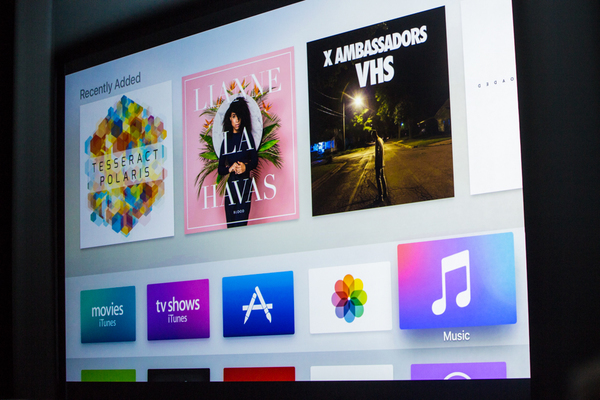 "Eddy talked about the fantastic new ways to interact with Apple TV. With touch I can interact with my apps. ... Quick swipe to go all the way across." 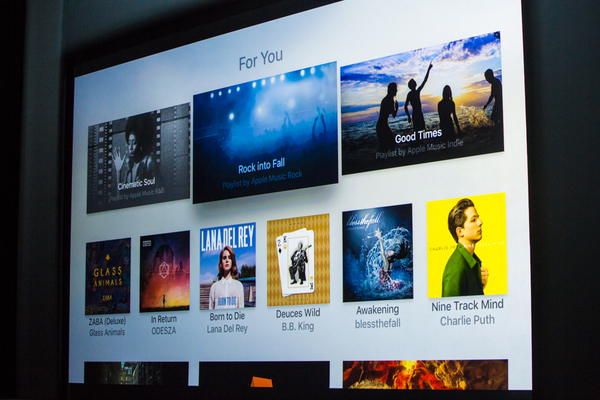 "Now the other great way to interact with Apple TV is voice. With Siri, it's easy to find exactly what I want to watch, like when my favorite actor makes an appearance on a TV show. "show that 'Modern Family' episode with Edward Norton." Remote swiping, you can fiddle with 3D movie poster. Cute...and a hint of possible interactiion for gaming. And Siri brings that up. Just click to play. "Touch also makes it really easy to move through the show. I just click and swipe." 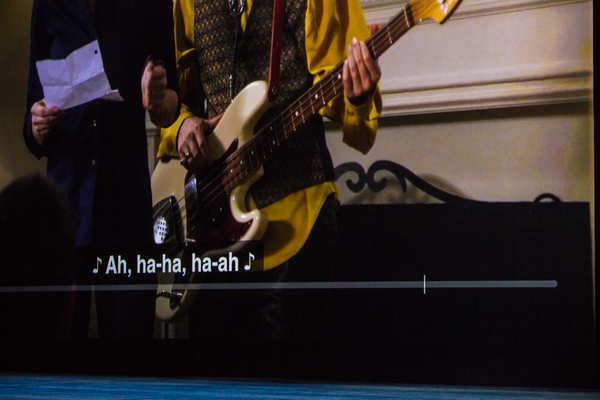 "I can use Siri during playback as well. 'Skip ahead 7 minutes.'" "For those times I missed what she said, 'what did she say?" 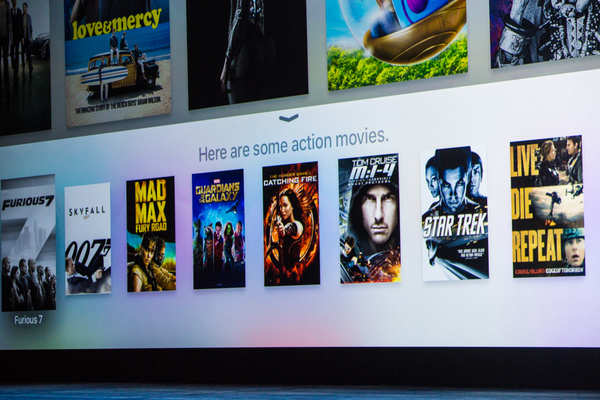 "Siri's really great at helping me find what to watch even when I don't know what it is. 'show me some action movies.'" I could search for David Lynch films with abandon. "What are some new movies to watch with kids?" "When I click on the movie, I'm taken to some beautiful full-screen view." 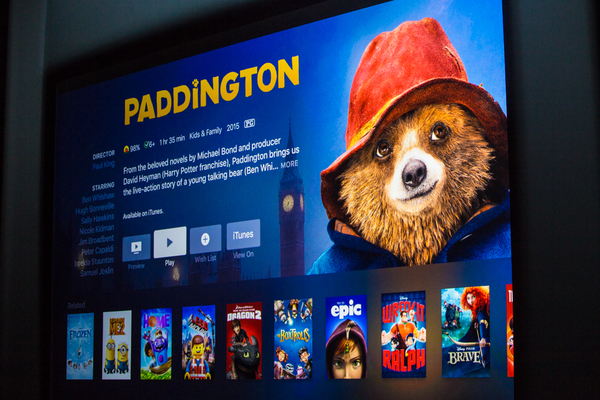 In the early days of Apple TV, the company positioned its streaming media box as a “hobby.” But it’s now the most popular device of its kind despite the fact it has gone three years without a hardware refresh. 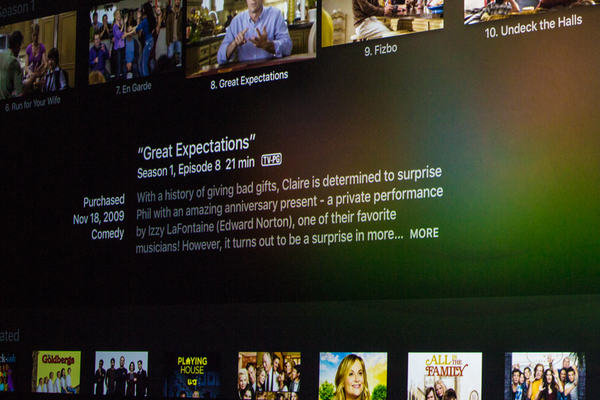 Apple in March cut the price for Apple TV by $30 to $69. As of the fiscal first quarter that ended in December, Apple had sold about 25 million units, and in 2013, it sold $1 billion worth of content directly off Apple TV, Cook said last April. 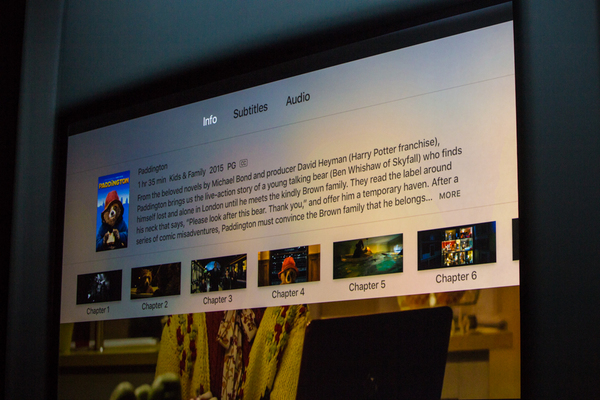 Most of Apple TV’s recent updates have been limited to the addition of new channels. Some of the most tantalizing possibilities -- such as a Time Warner Cable app that would stream live channels from the cable provider over the Internet -- have been teased without coming to fruition. 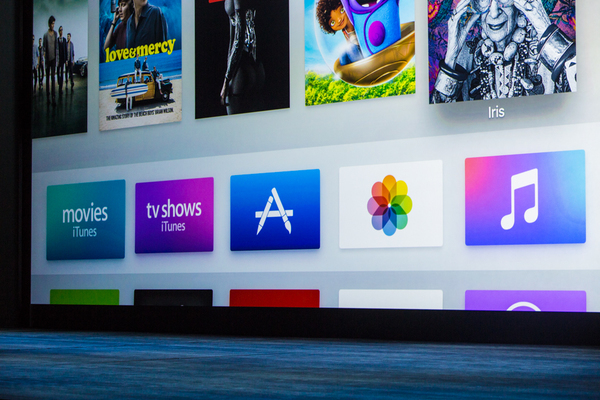 Apple was expected to introduce a new TV box and online streaming service at WWDC, but the company instead has delayed that announcement. At the same time, Apple also has faced more competition. Since Apple’s last Apple TV hardware update in March 2012, Google launched its $35 Chromecast streaming dongle, Amazon introduced its $99 Fire TV box and $39 stick, and Roku released its third $100 streaming box and its $50 streaming stick. The Chromecast met intense demand, while Amazon’s Fire TV incorporated features that made Apple’s device look outmoded by comparison, such as voice search and an optional gaming controller. 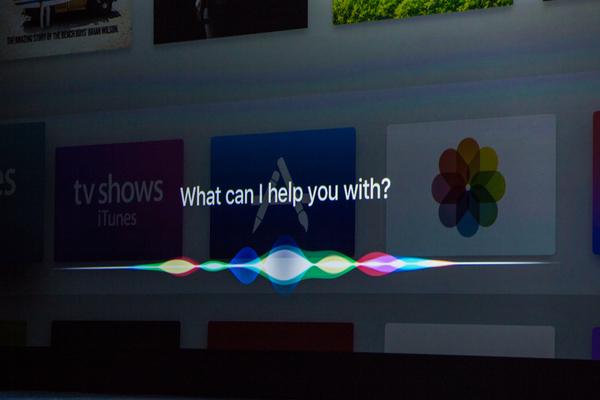 "I can ask Siri for information too. 'Who stars in this?'" 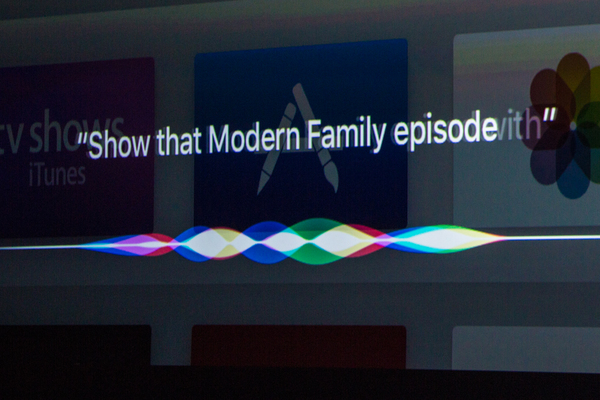 Siri will answer on the bottom of the screen so don't interrupt the show. 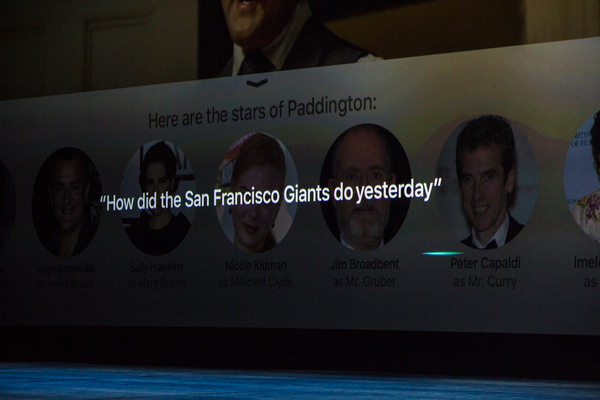 Can also ask sports scores and the weather, and Siri will bring up the answer on the bottom of the screen. 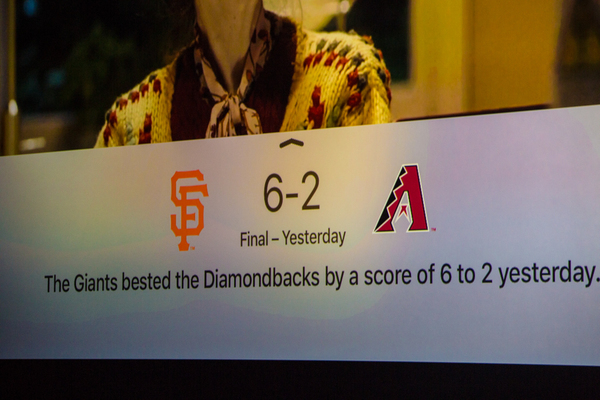 Pop-up info via Siri: lots of second screen-like info while watching stuff. You know, to annoy the kids during their movie. "If I want more details, I can just swipe up. 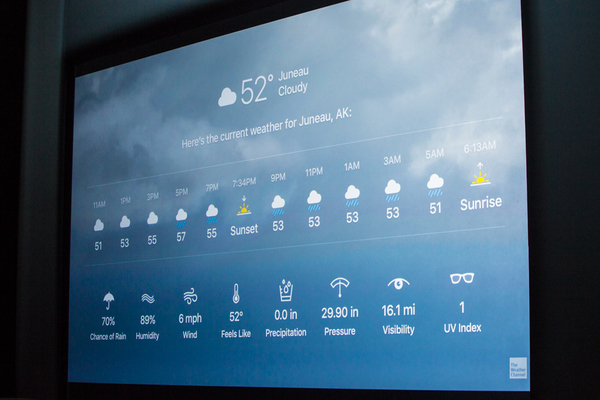 Siri wiill automatically pause the movie in the background and bring up the weather." 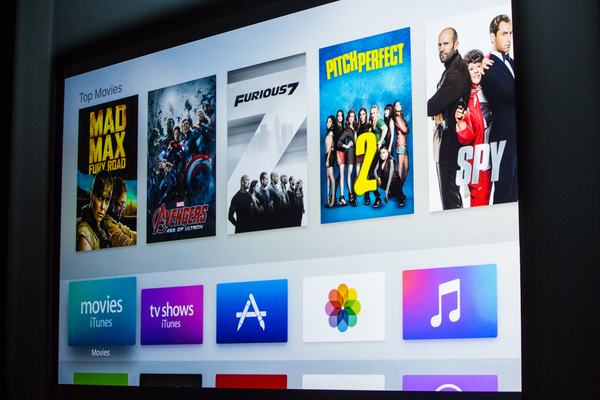 "It's super easy to switch between apps on Apple TV." "Dad, stop ASKING FOR THE WEATHER while I watch this show!!"